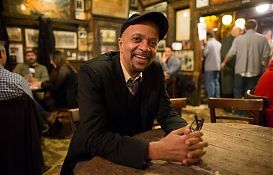 James McBride was so sure that his novel “The Good Lord Bird” was not going to win the National Book Award that in the final moments before the prize was announced last Wednesday at a black-tie dinner in Manhattan, he barely looked up from his plate of apple mille-feuille. Accepting the award in his tuxedo and black porkpie hat, Mr. McBride confessed to the audience of 700 publishing industry types that he had neglected to write a speech. “I was just trying to get through it,” Mr. McBride, one of five finalists for the award, said later. Yet it gave the publishing world a jolt last week when Mr. McBride swept aside competitors with better-known boldface names — Thomas Pynchon, George Saunders, Jhumpa Lahiri and Rachel Kushner — and was instantly elevated to a level of literary celebrity that he has yet to enjoy throughout a long career that has produced a critically acclaimed memoir of his biracial childhood and two novels (along with years of articles from his early days as a newspaperman for The News Journal in Wilmington, Del., and The Boston Globe). Over scrambled eggs, toast and coffee on Friday morning at a diner near New York University, where he has been a distinguished writer in residence for the last seven years, Mr. McBride was still shaking his head at his prize. He is an elegant, easygoing 56-year-old who looked impeccably unruffled and dry in a tie, black blazer and pale gold hoop in his left ear, despite having just ridden his bicycle through the rain. In the last 36 hours, Mr. McBride said, he had received congratulatory emails from at least 150 people. Text messages were flooding his cellphone. The National Book Foundation, which administered the prize, has promised a $10,000 check and a bronze statue. Mr. McBride, a lifelong musician, grew up in Brooklyn and Queens, studied at Oberlin and went on to the Columbia School of Journalism. The idea for “The Good Lord Bird” first developed around 2009, when Mr. McBride was conducting research at a historical society in Maryland. There, he became engrossed in the story of John Brown, the white abolitionist who led an ill-fated raid on the federal armory at Harpers Ferry, Va., an event that is often cited as the catalyst for the Civil War. Mr. McBride, who was raised in a churchgoing household, was fascinated by the firmness of Brown’s religious beliefs. In the course of his research, he visited Harpers Ferry more than a dozen times and read 30 to 50 books on Brown. His own novel took a comedic tack, beginning with a narrator, Henry Shackleford, a young escaped slave who is mistaken for a girl by Brown, who makes it his mission to lead Shackleford to freedom.